billy boy struck just the right note for the occasion. | The mind is an unexplored country. billy boy struck just the right note for the occasion. This time, the text belongs to someone else. A Youtube user by the name of billy boy posted it as a comment on the theme from Stingray. Too good a line to waste. I’ve been saving this for International Womens Day. You’ll enjoy it more in the larger view. « A new year, a new job. LMAO. Would no doubt be the same sentiment if human communication were just sign language. Could envision scads of middle fingers being flashed. Let’s take a moment to dwell on the middle finger and its invaluable role in human communication. Present world as it is, ALL my fingers WILL BE MIDDLE and I will proudly display them as such. Should that meet with disagreements: OK peoples, let me introduce you to Mr. Smith and Wesson, Mr. Switchblade from days past OR Mr. 12 Gauge Mossberg < He's just a Jewish friend..
All of are within easy reach, humble abode or the wagon train I drive. lol. I take it that the Mormons have you on their Do Not Knock list. Is she from Thunderbirds? IDK all those puppets were kind of creepy! 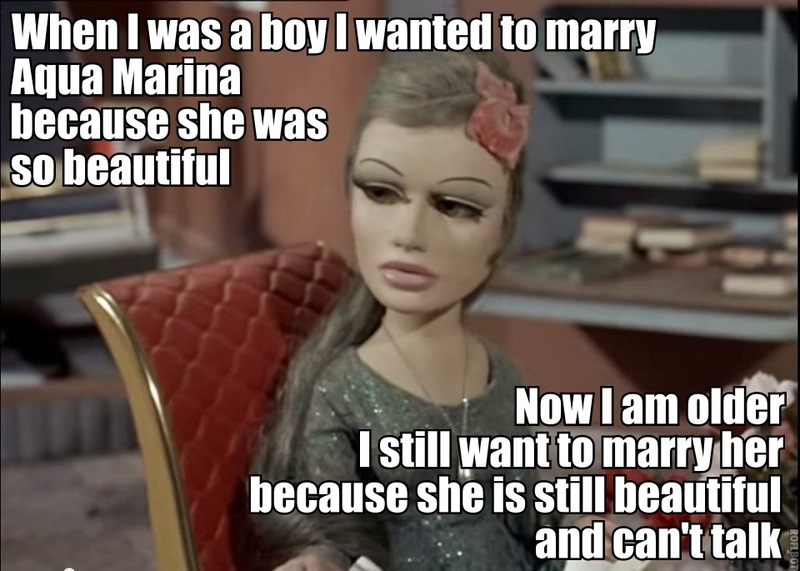 Marina was a character in Stingray which was also made by Gerry Anderson. The creepiest puppets were in Captain Scarlet. They were made to human proportions and looked anything but human!